Those of you with a love of art history know Giverny as the home of Claude Monet. Less than an hour by train from Paris, you can make the pilgrimage to Monet’s home and his spectacular Japanese water garden inundated with day lilies, the inspiration for many of the works that hang on the walls of the Musée d’Orsay in Paris and other impressive collections of Impressionism around the globe. Fat Tire Tours escorts riders from Paris’ St. Lazare train station to the quaint village of Vernon. Once you arrive, you head to an outdoor market to stock up on picnic food—soft, creamy Reblochon cheese, slices of yummy Rosette de Lyon sausage, duck liver pate, warm baguettes from the neighborhood boulangerie, juicy strawberries and apricots, and a bottle of wine to wash it down. After passing out bikes, our guide Andrew led us to the banks of the Seine River where we watched a family of swans swim as we dug into our goodies. Then we were off on an easy 5km bike trail that connects Vernon with Giverny. 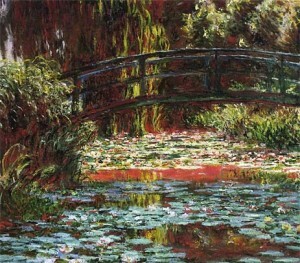 We entered the picturesque hamlet and were soon walking over that Japanese bridge seen in many of Monet’s works. The whole trip took from Paris took about 8 hours and cost 65 Euros per biker, a perfect day trip for our family of four. Visit ActiveTravels for more of Steve’s adventures. Fantastic. Your description, although short, sums up the nice trip entirely. The picnic sound marvelous!